Chess is a board game which has been around for at least 1500 years. Based on the idea of battle, players use a simulated ‘army’ in a series of strategic moves to ‘take’ their opponent’s pieces and ultimately capture the king (checkmate). This highly addictive game will test your child’s reasoning and logical thinking abilities to the max! Many studies have discovered that playing chess at an early age does increase a child’s mental fortitude, and overall health. Will Your Kids Enjoy Playing chess? Does your child like a mental challenge? If they can sit still and focus for long periods of time and enjoy a good battle of wills they might love playing chess. Chess is an activity the whole family can get involved in and your child might enjoy taking on their siblings or parents, you might even be surprised how good they are! In very exceptional circumstances some kids can start playing chess as young as 3! Most children have the maturity to understand the rules and start playing properly at around 7 or 8 but this depends on the individual child. Try to get your children into other kids’ activities if they seem too young too start. Some of the moves associated with the different pieces, particularly knights, can be complicated but you might be surprised how quickly your child picks up on them. They might be better off with a more physical activity or sport as chess does require a lot of focus and patience. How Can You Organise Chess for Your Kids? If your kids are keen to start learning chess, there are a couple of choices. Many schools run chess clubs during lunchtimes which gives kids a chance to learn the basics, make new friends and compete against others players from their school and even inter school chess championships. You may also find local private chess clubs in our ActiveActivities Directory. Your children will learn complex strategies and may wish to step in formal competitions within the chess clubs or at a regional or national level and measure themselves against the beautiful minds of their own age. Can your kids use a computer? Computer chess is growing in popularity and is a fun way for kids to take lessons and play online against other people. Just like the real life version, computer chess uses a black and white chessboard and all the same pieces including bishops, pawns and queen to simulate the real experience. 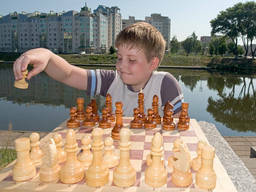 If your child gets into chess you will probably want to purchase a chess set which can be bought cheaply at a toy shop. Some portable chess sets can be slipped into a pocket. Playing chess is a highly enjoyable way to stimulate young brains and your child may reap the benefits for years to come!